This Cat Eye new-generation bicycle computer is unlike any other. No need for a manual... the OS walks you through its set-up, and even lets you customize the screen layout. Along with displaying standard cyclocomputer functions, it can calibrate using pre-set wheel and tire sizes, remember what day it is, and bar graph your mileage by day, week, month, six months and year. In the field, it has performed well. I purchased the OS 1.0 on Ebay last year after I read about Cateye upgrading them to 1.1. I sent mine in and got a brand new one back about 2 months later. The wait was due to the new models being shipped from Japan periodically and I had missed out on the latest supply. The new release added a time countdown option. Setup is fairly easy but the statement of not needing a manual is not entirely correct. Without the manual you would not know the first step is to format the unit. It is menu driven but there are 4 buttons to work with. Once you set the time/date, tire size, and the speed scale is changed from Km to Miles, its ready to go. The standards are all here including speed, average & max, dual bike option, clock, elapsed time, & odometer. Probably the most useful extended feature is the variety of ways to view your ride data throughout the year. You can view mileage from your last ride, the last week, the month, and a bar graph of the entire year . 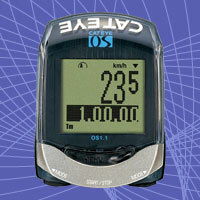 There is also a place to add personal info such as your name, birthday, and mileage from your previous cyclometer. Like most other models you can customize the display for data that you want to see on the screen as well as the font size. This unit will wish you a happy birthday if you happen to ride on that day, which happend to me this past September. It also congratulated me at the first 100 and 1000 miles. Sadly, it also asked me where I have been, since I had not ridden in a month. As for warranty, I bought mine over two years ago and just had a line of pixels go blank. I sent an email and support suggested I send it back for a replacement. Not bad for a $25 investment, I just hope its not a sign of things to come. Click here to find one on Ebay now.